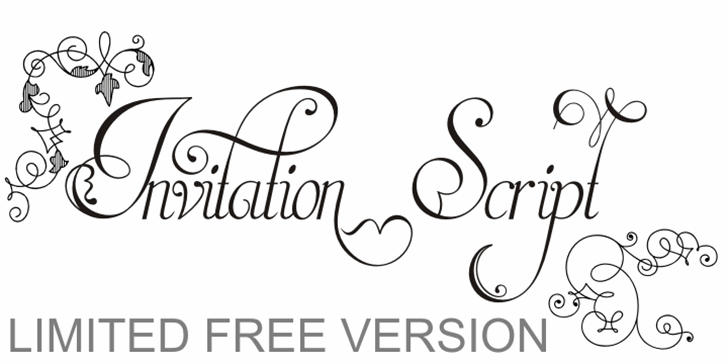 work on unusual and archaic styles, resulting in a special font - Invitation Script Archaic (soon available). fonts, three supplementary fonts for ornaments and fleurons, and the Archaic font with some of the Andrade's original characters. Embedded in the regular fonts are additional sets of letters. Over 40 variations are available for certain letters via the Special Sets Opentype table. contextual alternates and other open-type features. (ii) Many stylistic alternates for each letter (upper and lowercase, accessed via the glyph palette, encoded in the ranges of the Special Set Opentype feature). Since there are over 1100 glyphs in each font, we suggest using the glyph palette. of this calligraphic script. Let your imagination go wild and use Invitation Script in ways that Andrade could not have foreseen. In non-OpenType-savvy applications, Invitation Script is still an exceptionally beautiful calligraphic typeface that stands up to the competition. Thank you - this is such an incredibly beautiful font. this is sooo elegant. i luv it!! !